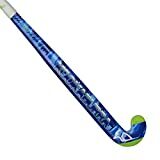 One of the most important features of modern composite field hockey sticks is the shaft bow position and yet it’s one of the most confusing to understand between all the brands. After deciding on which type of hockey stick bow position is important for your style on the field you’ve then got to pick through each hockey stick brands differing terminology. We have tried to make it easy for you here by grouping our best hockey stick reviews in to the position of the curve on the stick.